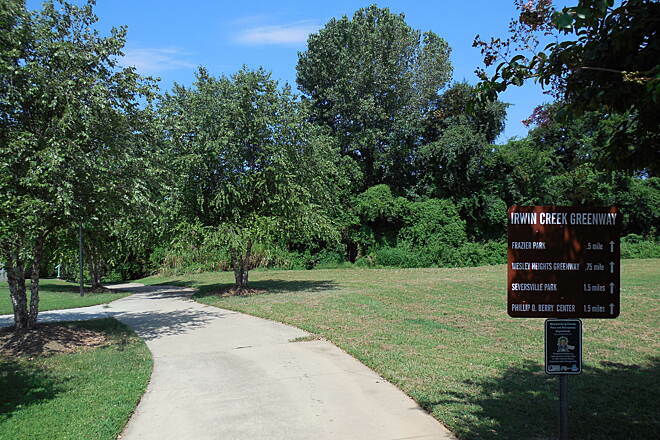 The Irwin Creek and Stewart Creek Greenways cover 2 miles of trail alongside their namesake creeks in Charlotte's city center. 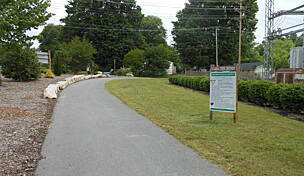 The Irwin Creek Greenway begins at Ray's Splash Planet and travels through Frazier Park and the Wesley Heights neighborhood. 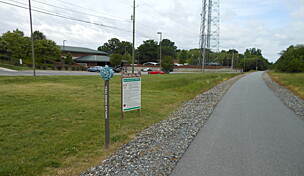 Around I-77, the trail becomes Steward Creek Greenway and continues to the Phillip O. Berry Recreation Center. 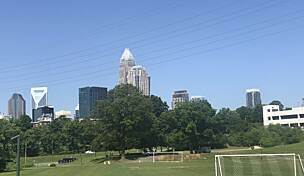 The greenways link surrounding neighborhoods to parks with picnic areas, playing fields and playgrounds. They also connect to a designated city bike route at 4th Street, used by many bicycle commuters. 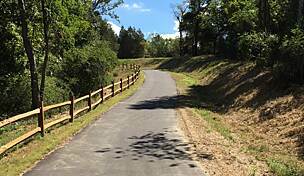 And both greenways are part of the growing Carolina Thread Trail, a growning trail network of more than 1,400 miles across North and South Carolina. 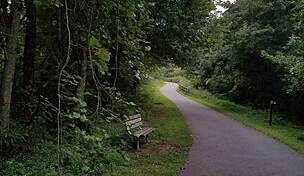 The greenways pass through three tunnels and take in a long line of sycamore trees at Sycamore Street. 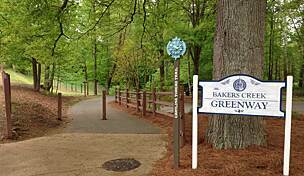 You can also access the Children's Memorial Walkway and Garden in Frazier Park. 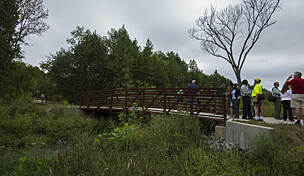 Amenities include Gateway Village, Johnson & Wales University, Ray's Splash Planet (with public art), Frazier Park, Phillip O. Berry Recreation Center and Seversville Park. Parking is available at Ray's Splash Planet, beside Irwin Avenue Open Elementary School, at Frazier Park (via 1st Street or Greenleaf Ave.), at Bruns Avenue Elementary School and at Philip O. Berry Recreation Center (via Bruns Ave.). 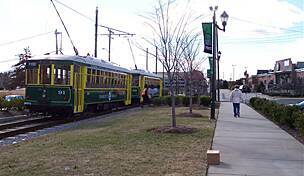 The greenways are also accessible by the following CATS bus routes: 1, 7, 8, 34 and 234. You should confirm all route schedules and stops. I started at Ray's Splash Planet and headed south past Frazier Park. After Frazier Park there is little signage. 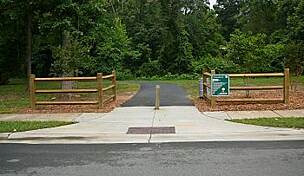 After passing under I-77 the trail is briefly gravel and supposedly becomes Stewart Creek Greenway (no signs). Through the Wesley Heights neighborhood it's very nice. 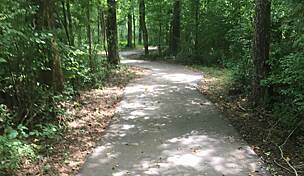 The trail then turns gravel again and the turnoff to take to get to Freedom Drive is on the left (again, not marked). 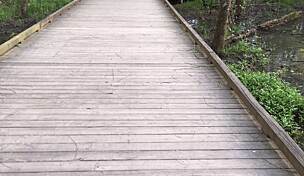 I would think a woman would want to walk/run/bike with a friend here. 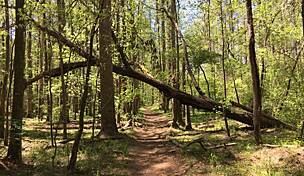 The trail is very isolated in places, even though you are in the middle of the city.